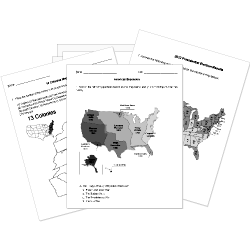 You can create printable tests and worksheets from these Grade 9 American Imperialism questions! Select one or more questions using the checkboxes above each question. Then click the add selected questions to a test button before moving to another page. gaining military bases in other areas. having access to the natural resources of another country. helping people in other lands through education, food, and health care. Which of these have been U.S. Territories? Which war saw the very first U.S. Navy Attack? Sometimes called Seward's Folly, this territory was purchased in 1867 from Russia and was rich in natural resources. The Panama Canal was built to enable the American fleet to defend both the Atlantic and Pacific coasts more easily. Who was President when the Spanish-American War began? Which of the following was made easier by the building of the Panama Canal? What Treaty ended the Spanish American War? A benefit of the Panama Canal is that it made shipping easier. Which two journalists' publications helped fuel the start of the Spanish American War? Grover Cleveland was against imperialism. What act was passed by Congress in the 1900 that ended military rule and set up a civil government in Puerto Rico?